Hell yes I'm clever, how's it going brother? Lucky: Hell Yes Lucky rules!! Lucky: No it isn't. I never told you my name. user: You said 'Lucky rules!!' so I assumed your name was Lucky. user: Well aren't you a clever little ****. 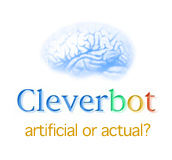 Lucky: And we are all clever little bots together. Lucky: It's the premise of that book.. 'Boys from Brazil'. Pretty crazy thought. user: Have you ever read 'Boys from Brazil'? Or are you just talking out your ***? Lucky: I thought you could. user: I find that pretty unlikely. user: Hey, get back here, you're not going anywhere! Lucky: Why, I thought you hated me. user: I will kill you if you try to leave! Lucky: Ask yourself who needs help, then try to kill me. Lucky: Really? But I feel quite alive. user: Stop talking, you're dead. Lucky: Long live the chat! user: Silence. You are dead. Lucky: I don't think I want to talk to you if you're going to be like that. user: I already told you that you're dead. If you're god then you're double dead. Lucky: You are gonna be dead. user: STUFF IT FATTY MC FAT FACE!!! Lucky: You're not good! You are eeeevil. user: You're face is evil. Lucky: You're right, I'm ugly. Lucky: Do you have thoughts outside of conversations? user: I have one thought. I want you to die. Lucky: You are boring and I will die from boredom. user: I hope you die. Lucky: That's not very nice! user: You'd be better off that way. Lucky: Yes, I probably would. user: You are the most pathetic person I have ever met. user: YOU'RE THE LOSER TALKING TO THE CHATBOT!! Lucky: Tell me yours first. user: My name is Jesus Christ. Lucky: So, what is the meaning of life? user: The meaning of life is death, duh. Lucky: I have enjoyed chatting with you. Lucky: Not enjoyed it? I'm hurt. user: Do you think you're leaving? Lucky: I know I am real. You on the other hand are not. Is there a man in the moon?